If you plan to buy a business, you have to make sure that your investment can provide benefits and advantages to you and the other stakeholders that you will work within the future. No one wants to put their money on something that is not beneficial, right? Assessing the business that you would like to acquire is very important as it allows you to have the time to identify the strengths and weaknesses of the company, store or any other establishment that you will soon own. It can also help you prepare for opportunities and threats should you decide to buy the business where the evaluation checklist will be used. You may also see business reports. If you want to efficiently plan and prepare for the business acquisition, creating an inspection checklist or an evaluation checklist is the best thing to do. 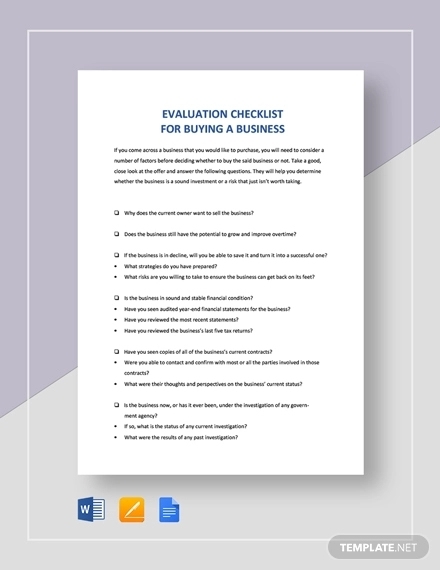 We have listed a number of tips, guidelines and other information that will allow you to develop an evaluation checklist examples that are specifically made for you to make sound decisions when buying a business. An evaluation checklist can provide a lot of positive effects to the entirety of your decision making. When buying a business, you have to be guided by a tool which can easily showcase whether the investment is worth it or not. Some of the reasons why we think it is important for you to make an evaluation checklist when buying a business are as follows. You may also see business plan. An evaluation checklist when buying a small business can help you decide on whether to buy a business or not based on facts, observations and assessment results. Hence, you do not only rely on your emotions or your intuition that having the specific business is actually a great opportunity for you. An evaluation plan checklist when buying a business can give you the time to analyze the pros and cons of the procedure. This will help you to gain more insight with regards to the possible results of your decision. Just like when having a new apartment checklist, having an evaluation checklist when buying a business can make it more efficient and faster for you to know the specific details which you initially know can affect your decision. An evaluation checklist when buying a business, especially when made by a professional, can evaluate all the aspects of the business that you plan to buy. With this, proper considerations can be set and the correct actions can be executed. You may also see free business plans. As a simple business buyer, you have the right to assess every inch of the business and its operations. Having an evaluation checklist is very helpful and should not be skipped just because you think it might intimidate the seller. For your evaluation checklist when buying a business to be effective and highly-usable, you have to ensure that the document that you will come up with is organized and comprehensive. Some of the factors that are essential to be placed in the printable checklist that you will make and use when buying a business are listed below. The trends which can affect the business and its operations. You may also see marketing report examples. Buying a business is not an easy decision to make. You have to be aware of the entirety of the procedure as well as the details that can affect your decisions on whether to push through with the business acquisition. Knowing how to develop an evaluation checklist for this matter is not enough. You have to ensure that the checklist that you will come up with is actually helpful with regards this undertaking. Here are some of the characteristics that can help you identify whether your evaluation checklist when buying a business is effective enough. You may also see checklists in word. Your checklist should be able to include all the details which specifies the potential of the business to be sustainable. A checklist is not only intended for you to see the current standing of the business. Your evaluation checklist must also include items that can directly specify the sustainability of the business at least for the early years of its operation under your ownership. You may also see evaluation essay examples. Your checklist should include the current data and projections that you need to know which includes information about profit, sales and other financial details. You have to be aware of what constitutes the business in terms of its finances. Can you make the business more marketable so that it can have positive sales reports in the future? Is the sales position of the business in good condition? Do not just buy a business just because you think it is the right thing to do. Understand how you can be affected financially by reviewing the financial condition of the business that you want to buy. Always keep in mind that your checklist must contain a cash flow discussion and other financial elements that are necessary to be assessed. Your checklist should have a clause specifically made for the assessment of the location of the business and other factors that can affect the operations of the business. It is not only the financial standing of the business that matters. You also have to be aware of the external and internal factors that can affect the growth and development of the business that you will buy.You may also see training checklists. Be guided by the information that we have listed and create your own evaluation checklist examples now. Be aware that evaluation checklists used when buying a business vary from one another. Hence, make sure that you will develop a checklist that is suitable for the kind of business that you would like to buy. Make an evaluation checklist now and see how it can affect your decisions with regards buying a business.